31 Fairfield is located on the west side of Fairfield, between Commonwealth and Newbury, with 29 Fairfield to the north, across Alley 432, and 33 Fairfield to the south. 31 Fairfield was built in 1877-1878 for banker and real estate investor Asa Perkins Potter, one of eight houses, four on each side of the block: 31-33-35-37 Fairfield on the west and 32-34-36-38 Fairfield on the east. He and his wife, Delle (Sheldon) Potter, lived at 29 Fairfield, built at about the same time. Each block of four houses was designed as a symmetrical group, centered on the paired entrances to the middle houses (33-35 Fairfield and 34-36 Fairfield). It appears likely that the eight houses originally matched in design, all with bays topped with conical roofs. 31-33-35-37 Fairfield remained unchanged as of 2015, but 32-34-36-38 Fairfield were significantly altered. The permit application for 31-33 Fairfield (one application for two houses) does not indicate the architect, but the application for 35-37 Fairfield (also one application for two houses) names the architects as Ober and Rand. The original permit applications for 32-34-36-38 Fairfield have not been located. Bainbridge Bunting’s Houses of Boston’s Back Bay attributes all eight houses to Ober and Rand, which appears likely given the similarity of design. On May 31, 1876, Asa Potter purchased the land for 31-33-35-37 Fairfield from wholesale dry goods merchant George H. Braman. The purchase also included the land where 246 Commonwealth would be built. On the same day, Delle S. Potter purchased the land for 29 Fairfield from George Braman. On October 21, 1878, Asa Potter entered into an agreement with National Bank of Commerce of Boston to purchase the land for 32-34-36-38 Fairfield. He completed the purchase on June 21, 1879, after the houses had been built. All of the land was part of a parcel previously owned by Nathan Matthews, part of an even larger tract which was purchased by Nathan Matthews on January 2, 1871, from David Sears, Jr., Frederick R. Sears, and Knyvet Sears. Click here for an index to the deeds for 31 Fairfield. Having purchased the land (or secured the right to purchase it), Asa Potter worked with builder Silas Whiton Merrill to construct the houses. He is shown as builder on the permit applications for 31-33-35-37 Fairfield, with mason John F. Richardson for 31-33 Fairfield and alone for 35-37 Fairfield. In all but two cases (31-33 Fairfield), after the houses were built, Asa Potter held the property until a buyer was found, and then sold the land with the house on it to Silas Merrill, who resold it on the same day or soon thereafter – presumably at a profit – to the buyer. The pattern was different for 31-33 Fairfield, the first two houses sold (both in August of 1878). 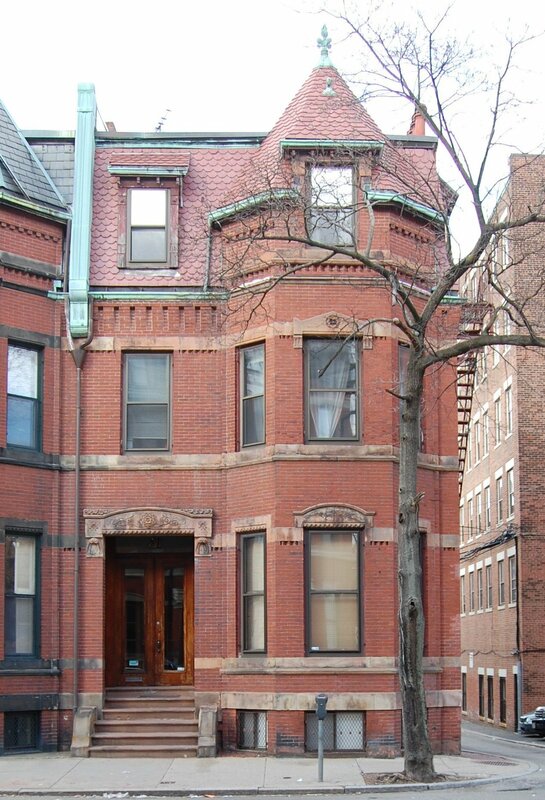 In the case of 31 Fairfield, Asa Potter sold the house to Jarvis Dwight Braman, president of the Boston Water Power Company, who resold it on the same day (Jarvis Braman was the brother of George H. Braman, from whom Asa Potter had acquired the land). In the case of 33 Fairfield, Asa Potter sold house to Silas Merrill, who then mortgaged it and transferred it back the next day to Asa Potter, who sold it soon thereafter. Silas Merrill had filed for bankruptcy in May of 1878, and the approach to these two sales may have reflected his financial position. The other six sales all were in 1879, presumably after his bankruptcy was resolved. On August 1, 1878, Asa Potter sold 31 Fairfield to Jarvis Braman. The deed included an easement reserving a three foot wide strip across the western boundary to provide access to the alley for the houses to the south. A similar easement was included in the deeds for 33 and 35 Fairfield. On the same day, 31 Fairfield was purchased from Jarvis Braman by Sarah Augusta (Spencer) Winslow Robinson, the wife of Charles E. Robinson, an oil and paint merchant. 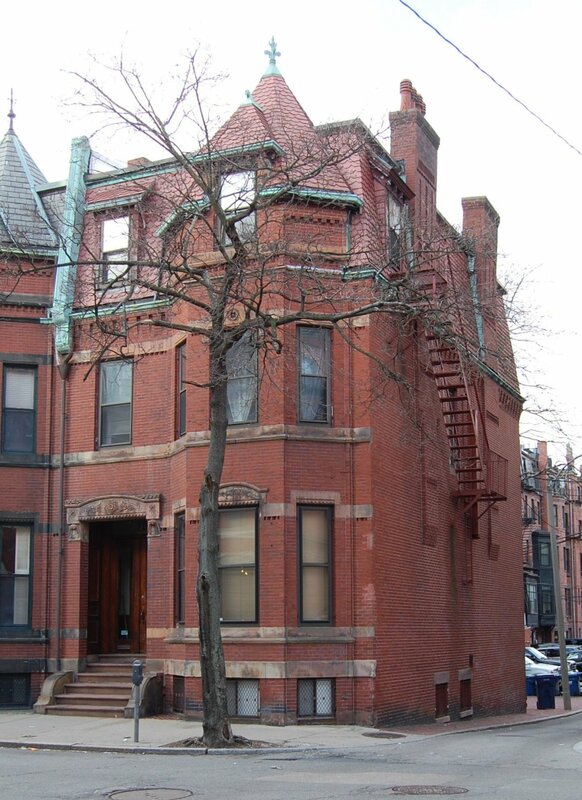 They previously had lived at 304 Shawmut. They continued to live at 31 Fairfield during the 1883-1884 winter season, but moved thereafter. On September 2, 1884, 31 Fairfield was purchased from Sarah Robinson by Herbert L. Perry as trustee for the benefit of his wife, Emma J. (Tilley) Perry. He was a real estate and mortgage broker and auctioneer. They previously had lived at 3 Park Square. On July 31, 1885, he transferred the property into his name, individually (rather than as trustee). Herbert Perry died in March of 1892. Emma Perry continued to live at 31 Fairfield until about 1910, when she moved to the Hotel Vendôme. She may had returned to 31 Fairfield for the 1911-1912 winter season (she is listed in the 1912 Blue Book at both 31 Fairfield and the Hotel Vendôme) but was living at the Hotel Vendôme again by the 1912-1913 season. The house was not listed in the 1913-1928 Blue Books. On February 1, 1928, 31 Fairfield was acquired from Birney C. Parsons, conservator of the property of Emma J. Perry, by real estate dealer Henry C. Brookings, who conveyed it on the same day to real estate dealer Ray C. Johnson, who conveyed it, also on February 1, 1928, to Miss Jennie Goodwin Knowland of Marblehead. In March of 1928, real estate dealer Victor Kaufman filed for (and subsequently received) permission to remodel the property from a single-family dwelling into a single-family dwelling and store, including adding a new storefront. Although the permit was granted, the work was not done. On April 3, 1928, 31 Fairfield was purchased from Jennie Knowland by Charles Lawrence Bond (known as Lawrence Bond) as rental property. He was a civil engineer and real estate investor. At the time of the purchase, he was living at 128 Commonwealth with his mother, Isabella (Bacon) Bond, the widow of Charles Henry Bond. In May of 1928, he filed for (and subsequently received) permission to remodel the property and convert it from a single-family dwelling into two apartments. In 1929, one of the units was rented to wool merchant and investment banker Richard Whiting Searle and his wife, Allan Joy (Ayers) Searle. They previously had lived at 316 Newbury. They lived there until about 1932 and also maintained a home in Marblehead. After they moved, the unit they had occupied became the home of Miss Gertrude S. Taber. She continued to live there in 1935, but had moved to an apartment at 90 Commonwealth by 1936. By 1930, the other unit was the home of Brooks Faxon, a civil engineer, and his wife, Virginia Grub (Parrott) Faxon. They had moved by 1931. Lawrence Bond married in July of 1930 to Barbara Dailey. After their marriage, they lived at 31 Fairfield in the unit previously occupied by the Faxons. They also maintained a home in Topsfield. They continued to live at 31 Fairfield until 1934, when they made Topsfield their year-round home. By 1937, one of the units at 31 Fairfield was the home of Harold A. Mack and his wife, Caroline Stevenson (Saltonstall) Mack. They previously had lived at 45 St. Botolph. Harold Mack was an importer, with offices and a store, The Artisans, at 165 Newbury. Caroline Mack was secretary of the Consumers League of Massachusetts and an active environmental conservationist. They continued to live there in 1939, but had moved to 31 Hereford by 1940. In 1937 and 1938, the other unit at 31 Fairfield was occupied by Mrs. Mary Wrenn (Allen) Stockton, the former wife of John Wilson Stockton. Their son, Philip Brent Stockton, probably lived with her. By 1940, they were living in an apartment at 207 Commonwealth. 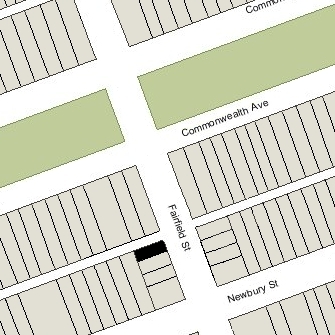 31 Fairfield was shown as vacant in the 1940 Boston City Directory. By 1941, the upper unit at 31 Fairfield was the home of Dr. Susan M. Coffin, a child welfare physician with the Massachusetts Department of Public Health. She continued to live there until about 1947. The lower apartment was occupied by several short-term residents. In about 1947, the upper apartment became the home of John Cornish Nott and his wife, Genevieve Margaret (Cronin) Nott. They were dance instructors with a studio on Newbury Street, first at 110 Newbury and then at 123 Newbury. The Notts continued to live at 31 Fairfield until the early 1960s, when they purchased and moved to 375 Beacon. 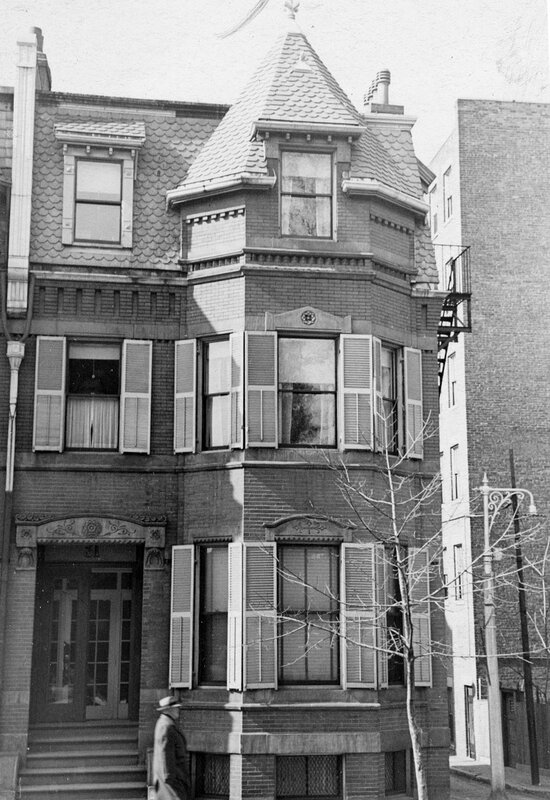 Also from about 1947, the lower apartment at 31 Fairfield was the home of Gladys (Lawson) Stanwood French, the widow of Eben Blaine Stanwood and of Philip French. She previously had lived at 14 Gloucester, where she operated a lodging house. She continued to live at 31 Fairfield until 1949, when she moved to 29 Hereford. On October 13, 1950, 31 Fairfield was purchased from Lawrence Bond by Eugene L. Metz and his wife, Gloria (Eastman) Metz, who made their home in the lower apartment. He was an English teacher at Thayer Academy. In 1952, they moved to Europe where he became a director of the Free Europe Committee, which distributed books promoting democracy to European and African students. In 1966, they moved to Quito, Ecuador (where they had met after World War II) to restore the Hacienda Cusin (which later became a luxury hotel). After Gloria Metz’s death, he became director of the Collegio Americano de Quito until the mid-1970s, when he returned to Boston and lived at 429 Marlborough. In about 1954, the lower apartment became the home of Dr. John Adam Twaddle, a physician, and his wife, Anne (Canty) Twaddle. They previously had lived in Maine. They continued to live at 31 Fairfield until about 1961, when they purchased and moved to 241 Marlborough. On November 24, 1961, 31 Fairfield was purchased from the Metzes by Sidney Samuel Kanegis and his wife, Eleanor (Smit) Kanegis, who lived in one of the apartments. They were both artists and operated the Kanegis Art Gallery at 123 Newbury, where they also previously had lived. On April 10, 1962, Sidney Kanegis transferred his interest in 31 Fairfield to Eleanor Kanegis. They separated soon thereafter. She continued to live at 31 Fairfield and operated an art gallery in Cambridge, he moved to an apartment at 236 Newbury and continued to operate Kanegis Gallery on Newbury. In about 1974, Eleanor Kanegis married again, to Philip Dane Levin of Cambridge, an attorney. In May of 1975, Eleanor Kanegis Levin filed for permission to change the legal occupancy of 31 Fairfield from two apartments to two apartments and a law office. She subsequently abandoned the application. On November 22, 1975, 31 Fairfield was purchased from Eleanor Kanegis Levin by John J. O’Connor. In April of 1989, he filed for (and subsequently received) permission to change the legal occupancy to two apartments and an office, legalizing the occupancy which probably had existed since he purchased the property. On June 1, 1997, he transferred the property to himself and his wife, Ellen O’Connor, as trustees of the 31 Fairfield Nominee Trust, and on December 6, 2012, they transferred it to themselves as trustees of the O’Connor Charitable Remainder Trust. In May of 2013, the O’Connors received permission to convert the property from two to three apartments. On July 12, 2013, 31 Fairfield was purchased from the O’Connors by the Brick Real Estate LLC (Judson Samuels and Aliza Samuels, managers of record). On May 21, 2015, 31 Fairfield was purchased from Brick Real Estate by the 31 Fairfield Street LLC. 31 Fairfield remained a three-family dwelling in 2016.